Oh my goodness are these yummy! Perfect for fall bake sales or potlucks. Don't be intimidated by the frosting. It's really very easy to make. The pecans on top are optional, but sure look pretty. My cupcakes were done right at 22 minutes, so keep an eye on yours so they don't overbake. Preheat oven to 350 degrees. Line 24 muffin cups or grease and flour a 9x13 baking pan. Combine flour, sugar, baking soda, salt, baking powder, and spices in a large mixing bowl. Mix in butter, buttermilk, and applesauce. Beat with an electric mixer for two minutes. Beat in eggs. Fold in nuts, if using. Fill muffin cups 2/3 full or pour into 9x13. Melt butter in a saucepan over medium heat. Stir in brown sugar and salt. Bring to a boil and boil for 2 minutes, stirring constantly. Remove from heat and stir in milk. Return to heat and bring to a boil once more. Remove from heat and let cool to lukewarm (about 20-25 minutes). Beat in powdered sugar until smooth. 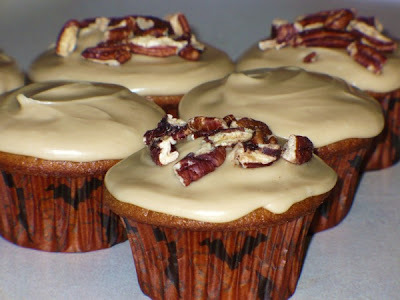 Frost cooled cupcakes and sprinkle with pecans if desired. Thanks for the great recipe....it sounds delicious and perfect for Thanksgiving or a Fall treat.